I went to an estate sale within very close walking distance, and immediately noticed these Kai pinking shears. They were on a small table right by the front door! 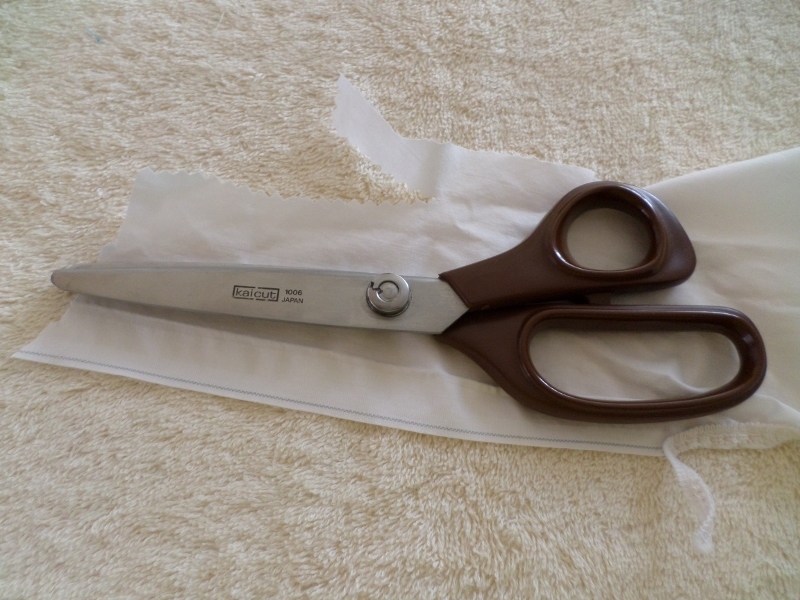 Before I bought the Kai shears I went home for a scrap of fabric to bring back and test them out, and they were sharp, easy to use, and cut beautifully. 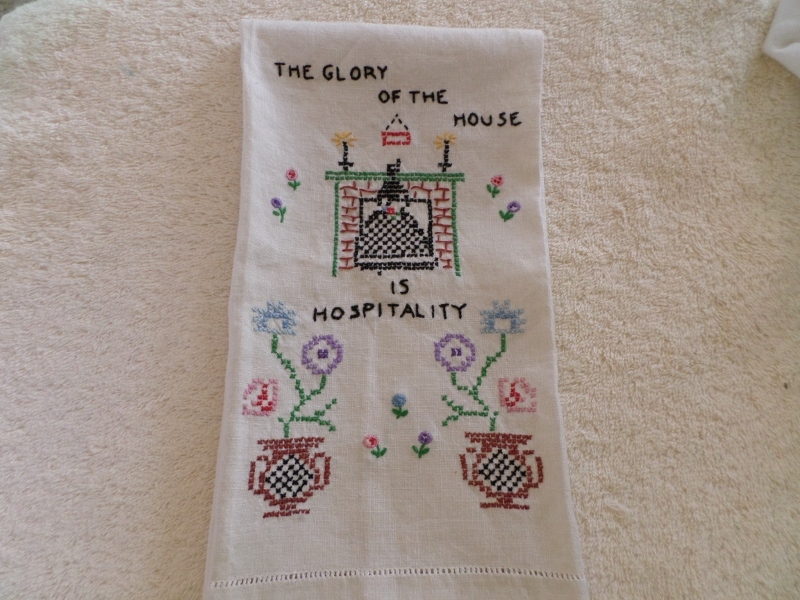 I also came away with this vintage and charming embroidered tea towel. I was happy with what I bought. But then, because the sale was so close, I went back the next day to see if there was anything else I might want, and to see what I could get at a marked down price. I noticed that that the former lady of the house had a large number of dolls, doll clothes, and doll parts, all in a jumble in boxes. Some were expensive collector type items, and others had obviously been played with by a little girl or girls. 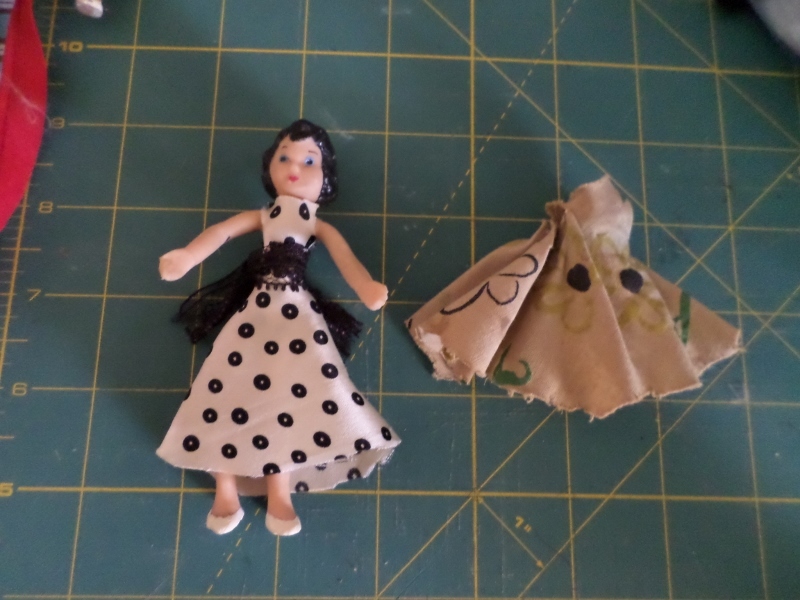 I started picking out some little rubber dolls about 4 inches tall, the type that would be used in a dollhouse. 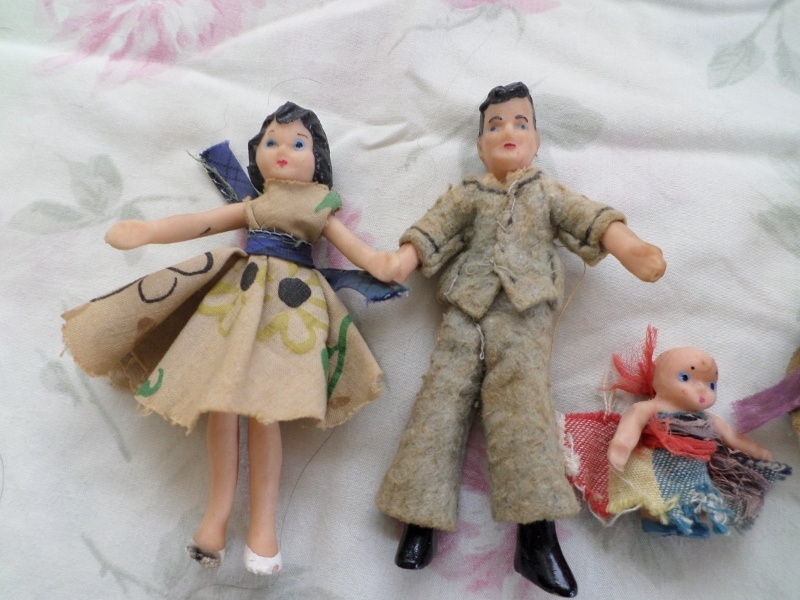 I estimate these dolls date from the 1950s or 1960s. 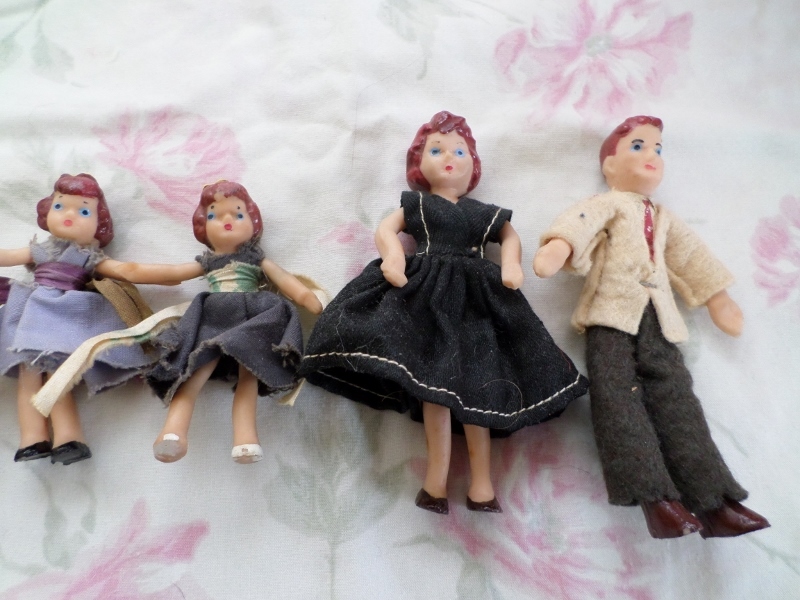 I didn’t know anything about the dolls, but as soon as I showed an interest, a woman asked me if they were valuable, and another said “You got all the best ones”. Ha! This red haired family was in good shape. The mother appears to have her original dress. Unlike the other dresses, her dress is stitched and hemmed. The dark haired couple were played with more, and their tattered clothing was clearly homemade. The baby just had a piece of fabric wrapped and tied. I was keen to spruce them up, and set myself the challenge of making them new clothes. The woman doll was easy to dress. I used a scrap of rayon fabric left over from a previous refashion, and I painted her shoe. The gent was harder for me to dress, as I had never made pants. 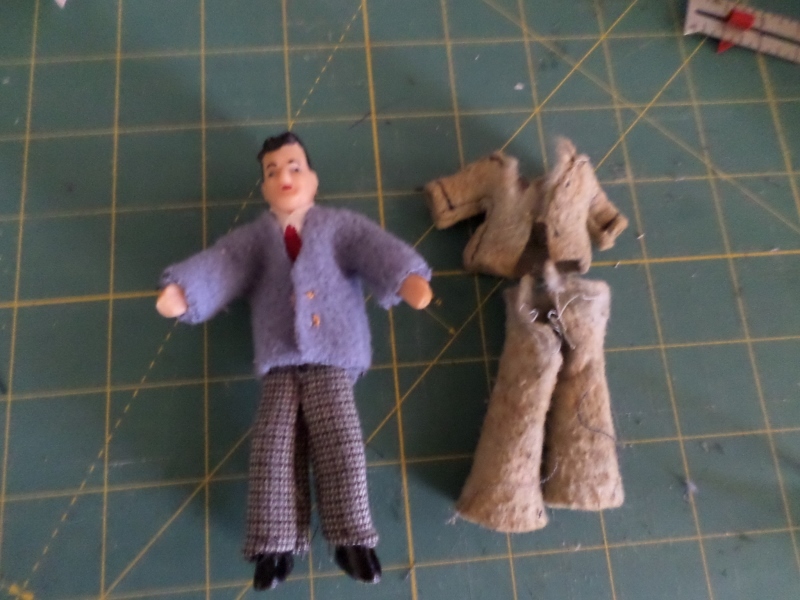 The fabric scrap I used for his pants frayed badly, making them hard to hem. They’re ready for their own photo shoot. They live in a beautiful land where the flowers grow very big! A piece of eyelet made a new dress for the baby. Much improved! A well dressed nuclear family circa 1960. 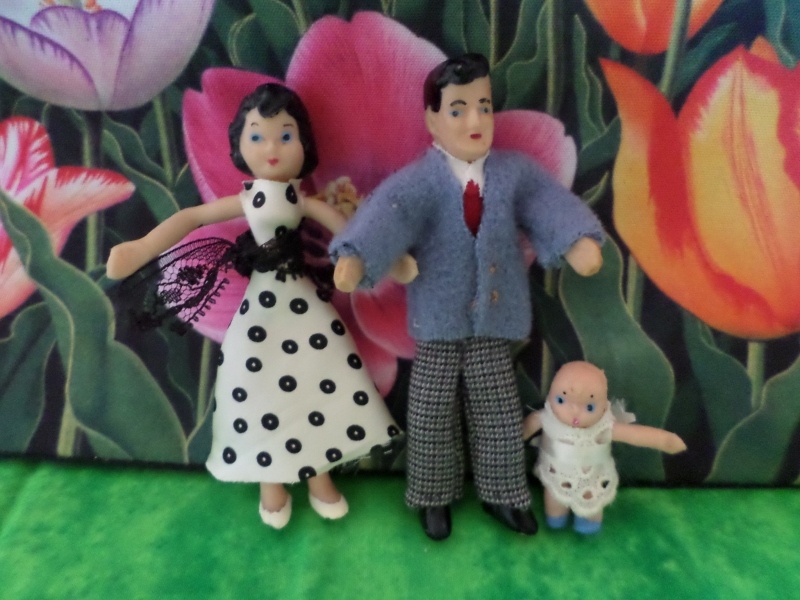 And they lived happily ever after in their magical doll land. 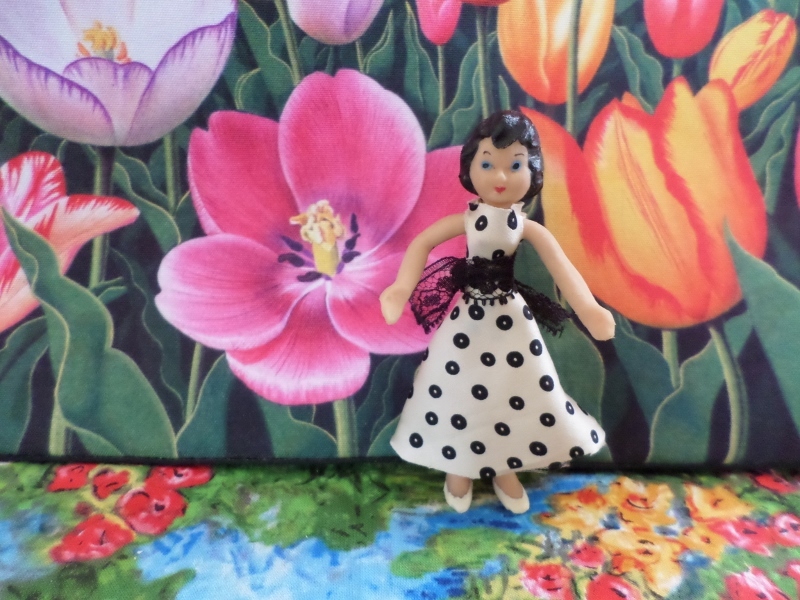 This entry was posted in Looking Back, Sewing, Thrifting and tagged doll clothes, dolls on June 28, 2015 by Stitch It Again. Who doesn’t like polka dots? 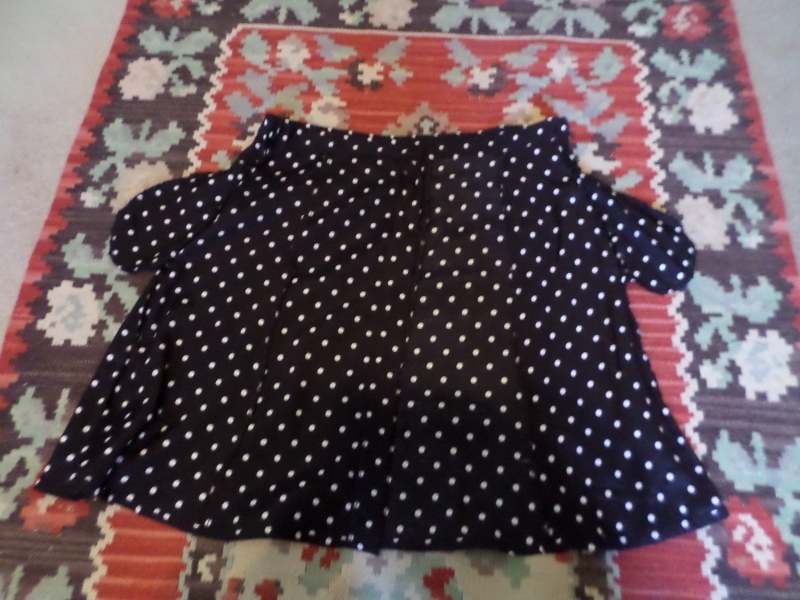 I saw this rayon, black polka dot skirt at the thrift store, and immediately knew I could make a classic look with it. The skirt has eight panels, and buttons up the front, with a 1 inch waistband with elastic in the back. I had a generous amount of material to work with, which is never a bad thing. Look at the size in comparison to another knee length skirt I refashioned. I decided to keep this job easy and simple! Instead of removing the waistband, I just cut down the two side seams, removing about 1 and 1/4 inches on each side. I cut pockets from my remaining fabric, and resewed the side seams placing the inseam pockets 3 inches down from the waist. I cut the length off of the bottom, and made a 1/2 inch double turned machine sewn hem. I love the A-line shape – smooth at the waist and moderately flared at the hem. I find this shape is the most flattering, and comfortable for me to wear, walk in, and sit down in. No riding up! I think this skirt would be easy to copy: trace and cut 8 panels on the straight of grain, add pockets, a waistband, and buttons. I’m wearing it with a fine gauge sweater shell. I would like to wear more woven tops and blouses, so I intend on sewing a few. My turnaround from buying this skirt to finishing it was very quick, because I wanted to wear it right away. Due to gaining weight, and becoming more rounded, some of my skirts were getting too short! The fit had changed by the skirts riding a little higher on the waist, and having more to cover in the back. 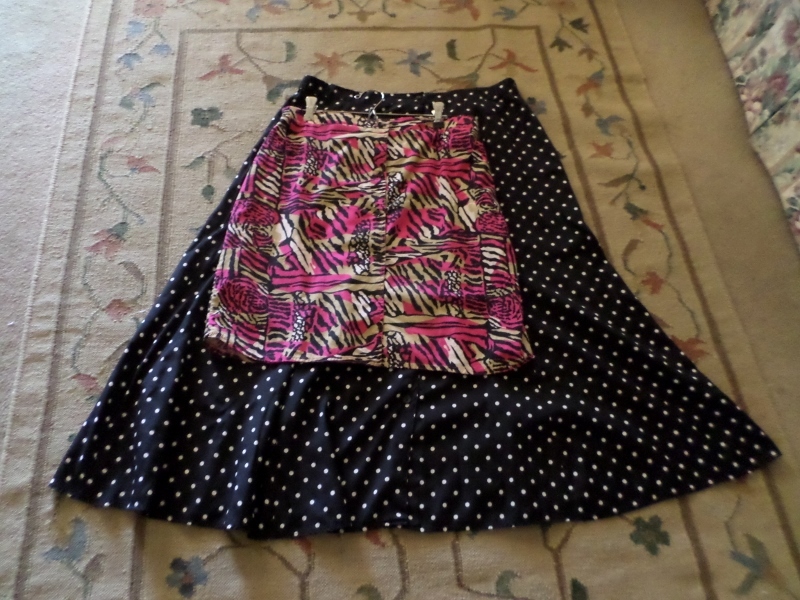 I love my new cool, flowy polka dot skirt, and know I will wear it a lot. 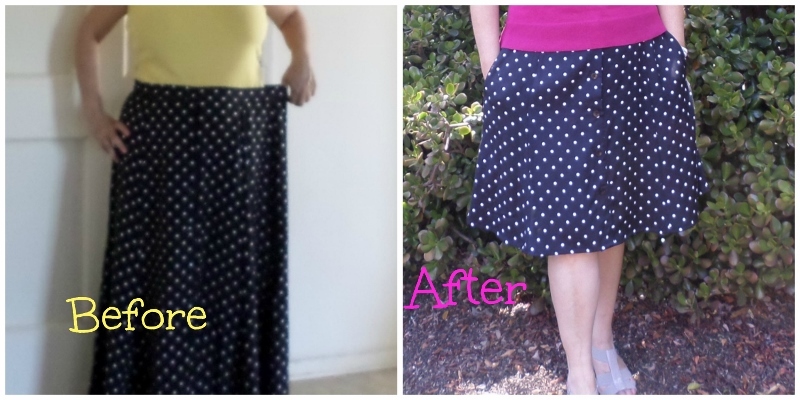 This entry was posted in Refashions, Sewing, Thrifting and tagged big skirt refashion on June 5, 2015 by Stitch It Again.